Home › Where to Meet Singles › Single and Searching? Time to Get Out and See Where to Meet More Singles! Single and Searching? Time to Get Out and See Where to Meet More Singles! Memorial Day weekend is signals that summer is here and it’s time to get out and play! This is especially true for those of us who suffered the cold and arduous winter months. And, it’s a great time to get away from the computer and connect with people face to face! The problem is where to meet singles who are serious about finding a lasting relationship? For many who are not in a relationship, they are seeking activities where they have a good chance of meeting new friends and possibly their true love, as well. It was this time of year when I met my husband (actually reconnected with him if you read my story) at a weekend barbeque after a biking group ride. Granted, he didn’t have the nerve to ask me out then, so he made sure that he was on the weekend trip that this group was planning in June since he heard that I was going. How do you decide where to spend your precious free time during the weekend or weekday evenings? With Googling events and groups and Meetup, you can be busy every day of the week if you want to be. And, you may be spinning your wheels if you don’t think this through this strategically. First, to figure out where to meet singles seriously searching for love, you want to focus on groups where you are with like minded people in your age group and who you share similar life goals. For instance, if you are in your 30’s, professional and marriage minded with a goal of having a family, you want to find people to socialize with that are in the same stage of life as you are. I suggest you investigate where your similar tribe hangs out. However, if you are in your 50’s, divorced (or widowed) and looking for a serious relationship (and not necessarily marriage right away) then your goal may be to meet more single friends and to find groups with people to socialize with who have a similar life focus. In this situation, you can meet people who want what you do- a significant, committed relationship. 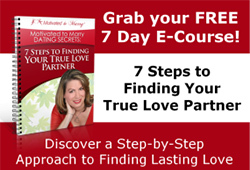 In my Motivated to Marry Dating Secrets coaching program I teach you how to use my VIPP formula to help you figure out where to meet singles that can lead you to your true love. First, you have to find activities and groups that work with your PERSONALITY. The more extraverted, socially comfortable people clearly have an advantage here over more shy, introverted people. Not that introverted people are not social. They just require a different way to successfully connect with people. Usually they prefer smaller groups and those groups focused a specific purpose or activity that meet several times instead of only one time with no hope of seeing the same people twice! Now the most obvious way to meet people is through your INTERESTS. What do you enjoy doing during non-work hours? Are you a sports person? Into culture and the arts? Love to dance? Do you enjoy discussions? There are groups for every interest – both Meetup and those that stand alone. I found that many ski clubs do more than just skiing- they are year round activity groups. This was true of the Washington, DC Ski club of which I was a member. We had boat cruises, hikes, biking trips and even theatre outings, not to mention fun happy hours. Next VALUES are where I focus most heavily with my clients and has the most impact. What is very important to you? What values do you want to share with your partner? Don’t you want to meet people who share your core values? This is where connection occurs. For instance, if your value is learning and personal growth, then you may want to join a group that focuses on that so you can meet a partner who shares your desire to grow and improve. If you believe in giving back to your community, then finding an organization that offers you the opportunity to volunteer can be where you will meet people who share similar values. beautiful voice. What passion do you have that you can share with a life partner? Where could you meet someone who would share your passion? Now that the weekend is over, you have the whole summer to get out and meet all sorts of people. And as you expand your network according to your VIPP, it may lead you to a romantic connection. What are you committing to do to get out and figure out where to meet single people with whom you will connect? PS. If you are ready to focus on finding true love this summer and want more support and accountability around this effort, go to www.talkwithcoachamy.com and fill out my Get to Know You form so we can explore the best way I may support your relationship goals. I have both group and private coaching openings currently. My clients are stretching past their comfort zone and meeting great people. Many have met their life partners and have gotten married!